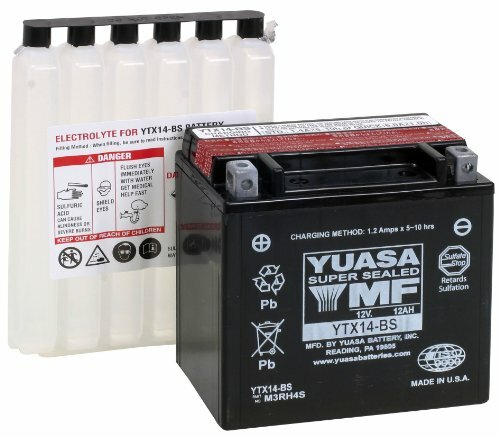 After a lengthy amount of time researching and conversing with other motorcycle owners, I decided to step up to the plate and bought what these others believed to be the best, which was the YTX14-BS Yuasa battery. I own a 2003 Yamaha V-star 1100 and the size was a perfect fit. I was initially weiry of an after market product due to the slight differences in size [don't be]. I shopped many other websites, but I came back to my "old faithful" site, AMAZON.COM. The shipping time was better than their estimated amount of days, which put be back on my motorcycle quicker. My first Yuasa AGM battery lasted 7 years! I used a float charter about 1 week per month. With this kind of service life, I gladly bought my 2nd one. Highly recommend the Yuasa maintenance free AGM batteries. Wish I would have bought this first! I bought an aftermarket battery from a great company but the battery went bad in 4 months. I should have stuck with the Yuasa but tried to save a few dollars. The battery arrived quicker than expected and has been trouble free. The orginial Yuasa lasted 5 years and hope to get that out of this one. By the best the first time around and you won't be disappointed!